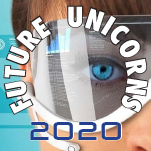 Front Page→Building a Unicorn→Retrospective of a Unicorn: 2020 A.D.
Retrospective of a Unicorn: 2020 A.D.
Last week, I posted “20-20 hindsight-insight into a Unicorn” which discussed the process of seeing the forward path (insight) to building a Unicorn tech startup by first envisioning the startup from the future – as if one is actually there, reminiscing (20-20 hindsight) about the path one took to get there. Fortunately, since the human brain is incapable of differentiating between imagination and reality, deriving future insight via hindsight from the perspective of a clearly imagined future is not only possible, in my experience it can produce sharp details on critical decisions made along the path, not merely fuzzy concepts. Not that I require any validation to what I know, it is good to body of work emerging that supports the the application of insight via hindsight to business-building. After receiving a few emails questioning my approach, a colleague brought to my attention that Karl Sakas introduced his concept as “Advance Retrospective” a couple of years ago. Then, Daria Bagina comes close, but completely misses the visceral connection in her “Retrospective Techniques: Futurespective for New to Scrum Teams“. She states that “You can’t yet look at the past to do a proper retrospective, instead you can use this time to look into where your team wants to be.” Her lesson underpinnings suggest that teams should “think about” and “understand” a future state, clearly directions made to third party observers. The futurespective can only be indistinguishable from reality if that future is experiences in first person. 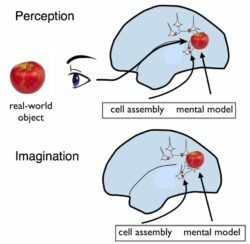 Taking this real v. imagined notion further, in Perception and Imagination: a Neuroscientist’s Perspective, John Kube notes that evidence is mounting regarding the existence of “cell assemblies” that correlate to a “mental model” – what the brain perceives, suggesting that either imagination or vision can create the identical mental image (Fig. 1). There are many more published studies on this topic, but my first read of R. Buckminster Fuller’s book on education many, many years ago was all I needed to explain my ability to dream a reality, and to then create it true to every detail in the real world. I suppose at least one argument that may survive any disagreement between “believers and nonbelievers” of this concept, regardless of being real or imagined, is whether the glass is 1/2 full or 1/2 empty. As an entrepreneur building unicorn, my glass is half full – a reflection of my general worldview optimism.